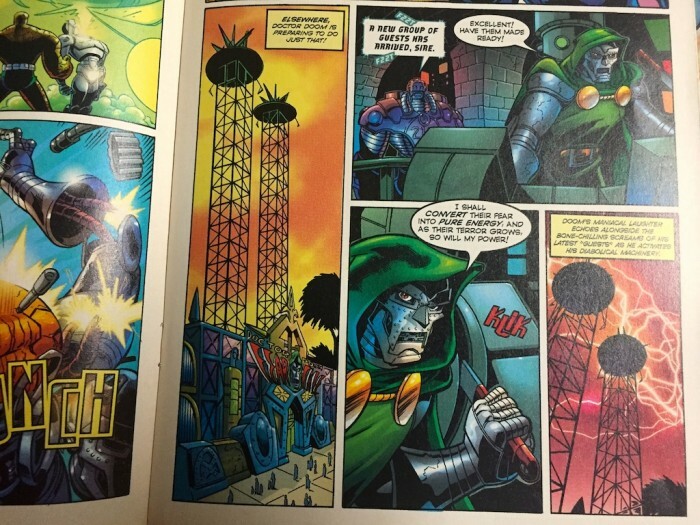 This week’s SATURDAY SIX takes a look at the Six Best Theme Park Related Comic Books. To steal a phrase from Forrest Gump, comic books and theme parks go together like peas and carrots, especially Disney. In fact, the Disney characters that we love to meet in the parks so much starred in their own comics going back all the way to 1940. 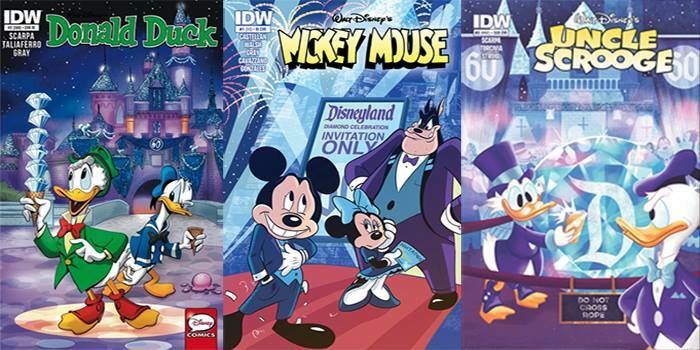 Despite switching publishers several times over the years, Disney comics continue to be produced today, most recently by Marvel and IDW Publishing. 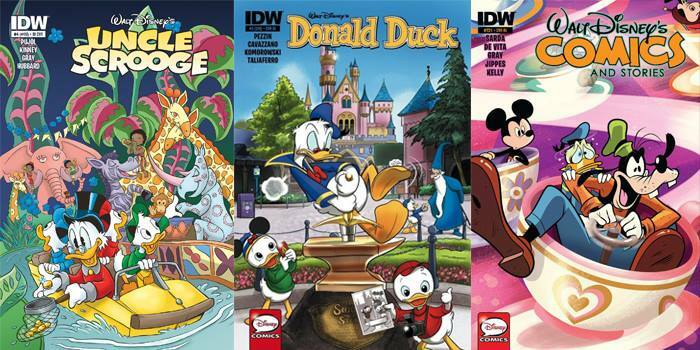 To celebrate the launch of their new line of Disney books, IDW has been releasing variant covers on all their Disney titles focusing on the theme parks. This is more than likely the one book on the list which most readers have seen because it was a giveaway at Epcot back in 1985. 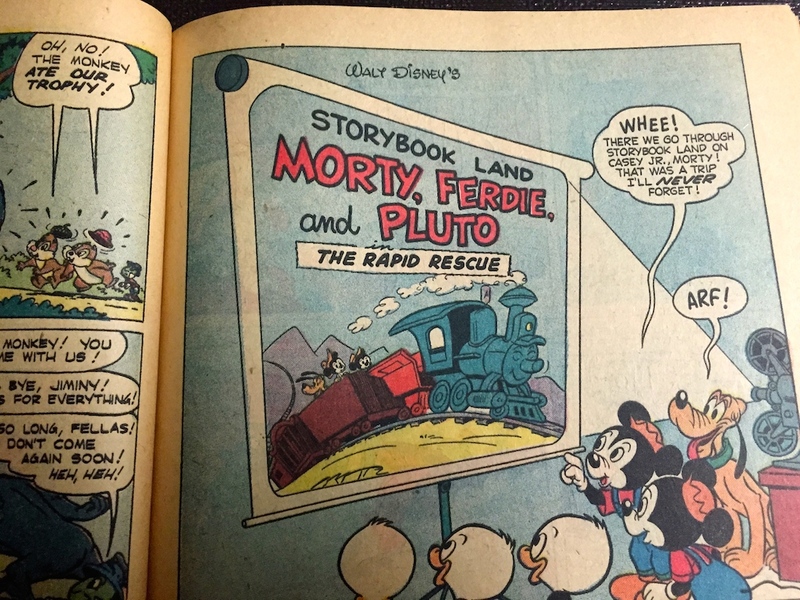 The comic features Mickey Mouse and Goofy exploring the Universe of Energy pavilion, better known today as Ellen’s Energy Adventure. 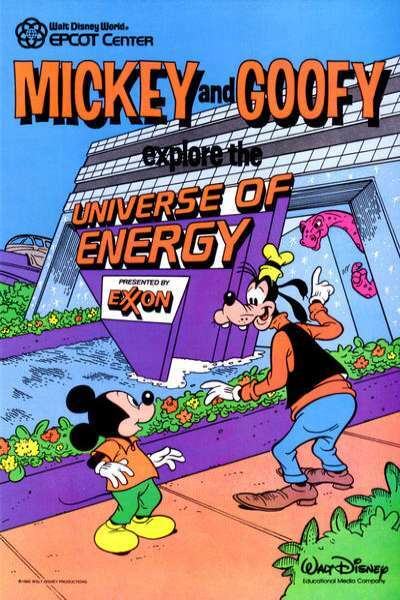 From the attraction’s beginning up until 2004, Exxon was the sponsor and the comic is little more than propaganda for the fossil fuel industry. The comic starts with Mickey and Goofy in the Universe of Energy pre-show and boarding the ride vehicle. 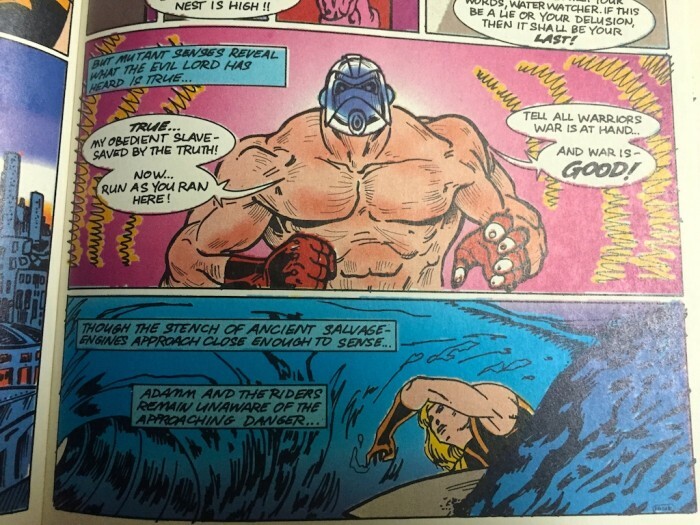 These are my favorite parts of any theme park comic book. Forget the story, I just love seeing the landmarks and attractions drawn on the page. The pair even travel into the portion of the ride with dinosaurs, which made me very happy. Mickey and Goofy then spend the rest of the book talking about the history of energy consumption, how we currently get fuel, and what we can do in the future. 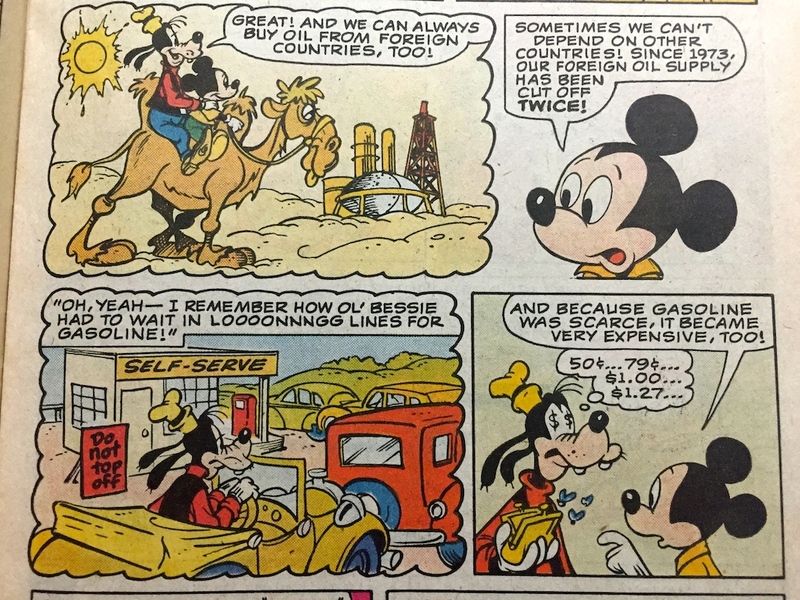 In one great scene from the book, as Mickey describes to Goofy that gas could become expensive if we were cut off from foreign oil again, Goofy fears the day of gas sky rocketing to $1.27 a gallon. I wonder what ol’ Goof would think of $5.99 a gallon gas near the Disney Outlet Store? Mickey Mouse references the 1973 oil crisis and the 1979 energy crisis. Hey Kids! Comics! While some lip service is paid to finding alternate sources of energy, the book is mostly focused on highlighting the true heroes of industry: people who drill for oil. Drilling in Alaska, drilling off a ship, deep sea oil platforms, basically anything Exxon is involved in. In another wonderful scene, Mickey shows Goofy a map and explains how a pipeline leads oil from Prudhoe Bay in the northern part of Alaska down to Valdez in the southern part. Hmmmm, the Exxon Valdez…where have I heard that before? In the end, this is a comic book about learning, which – for kids – is like getting socks for Christmas. This comic is actually a behemoth, clocking in at almost 100 pages. It’s huge, and the type of “treasury” that you used to see all the time in comics up until the 1980s. You truly feel like you’re getting your bang for the buck when the comic book you’re reading the is the size of a small town’s telephone book (I can sadly hear Millenials worldwide asking “What’s a telephone book, grandpa?”) The book itself is more a collection of old stories with a new intro by characters saying they took place inside the parks even though they clearly didn’t. 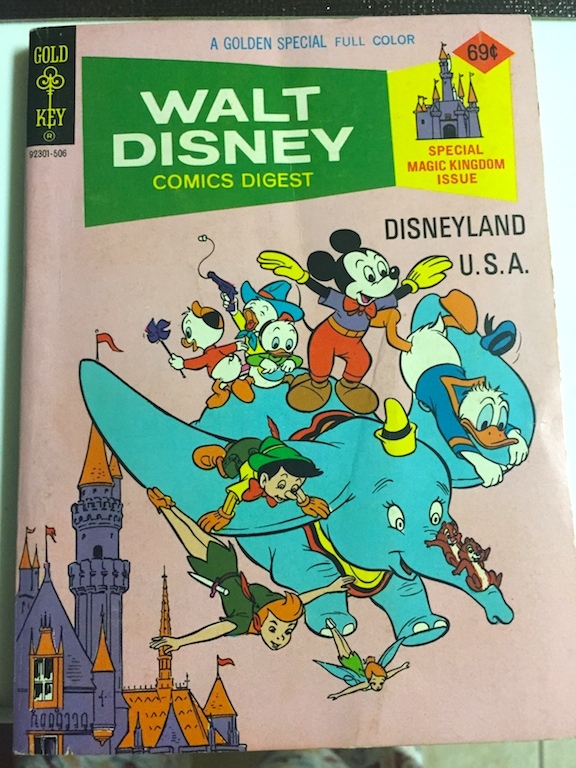 This issue has Donald Duck in “Keelboat to Kickapoo” (Frontierland), Mickey & Goofy in “The Captured Castle” (Fantasyland), Grandma & Uncle Scrooge in “Main Street Mishap” (Main Street USA), Chip ‘N’ Dale in “The Small-Fry Safari” (Adventureland), Morty & Ferdie & Pluto in “The Rapid Rescue” (Storybook Land), and Minnie & Daisy in “Visit to Venus” Tomorrowland. The book closes out with some puzzles and activities. Non-comic book readers may also be wondering who Morty and Ferdie are as they have been all but Song of the South’d into the Disney Vault. They are Mickey Mouse’s nephews and are seen in Mickey’s A Christmas Carol, with Morty playing Tiny Tim. Morty and Ferdie, the lost mice of Disney. 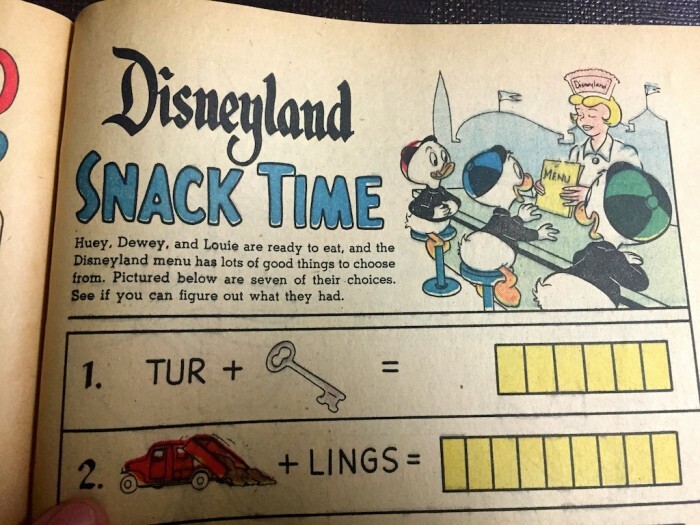 We’re gonna see if Disneyland guru Guy Selga can crack these codes. 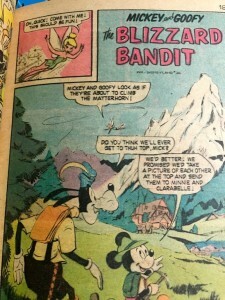 For a great read on the history of Western Publishing’s Disneyland comic books: CLICK HERE. 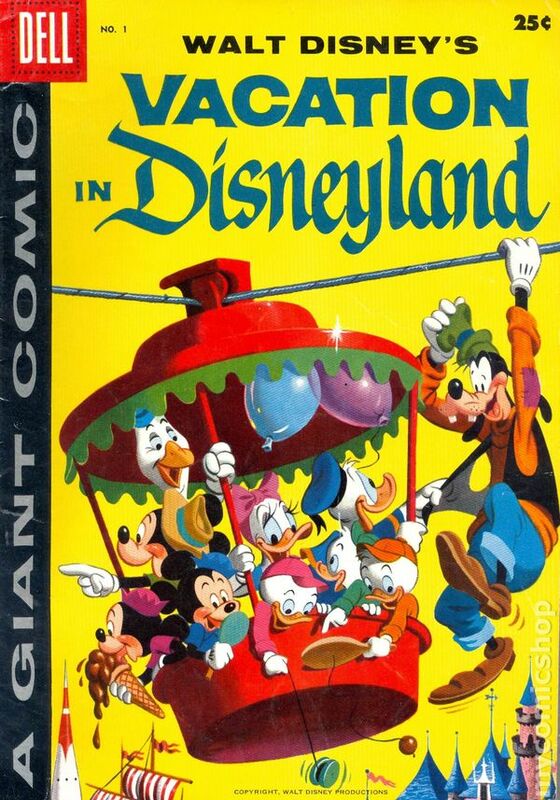 Author Dan Cunningham takes a deep dive into what led to the creation of these books with a ton of wonderful facts, including the books getting a lot of retail space on Disneyland’s Main Street USA. Be sure to also read PART TWO which covers the early WDW comics including an amazing Country Bears Jamboree/Frontierland story you can read in full. 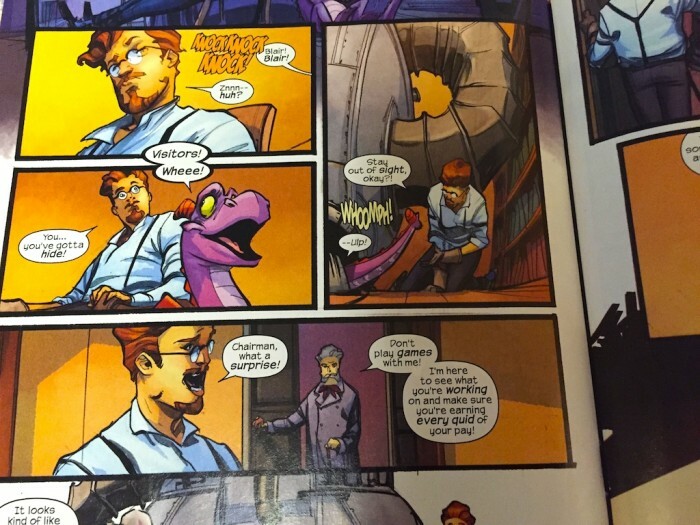 Everyone’s favorite Epcot dragon Figment became the star of his own book in 2014 under the new Disney Kingdoms imprint at Marvel comics. A five issue limited series that was eventually collected into a single book, Figment eschews the more “cartoony” style of traditional Disney comic books and does a much more serious take. 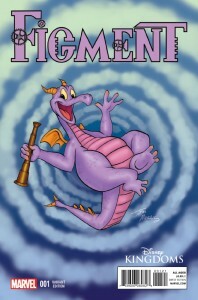 The comic series reveals the backstory of Figment and another popular Epcot fan favorite – The Dreamfinder – in a fun story that thankfully was successful enough to spawn not only a new Figment series, but helped the Disney Kingdoms line continue on with a comic based around Big Thunder Mountain Railroad. You can even find these books sold in the Disney parks as well as Disney Springs. 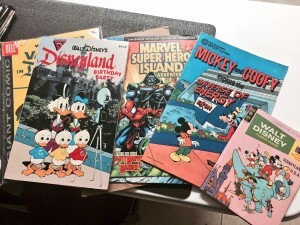 As a comics reader, I never understood why Disney wasn’t offering their comic books at the point of sale counters, much like you see Archie comics sold at supermarkets. They are relatively inexpensive, and something that might help develop reading, writing, and artistic skills. 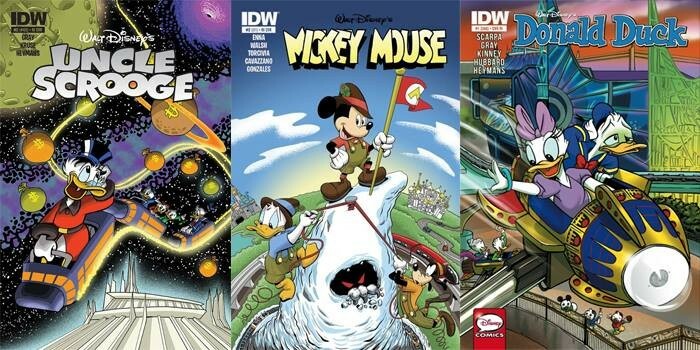 Serious comics involving characters such as Figment and attractions like Big Thunder has me excited about what the future of Disney comics could bring. 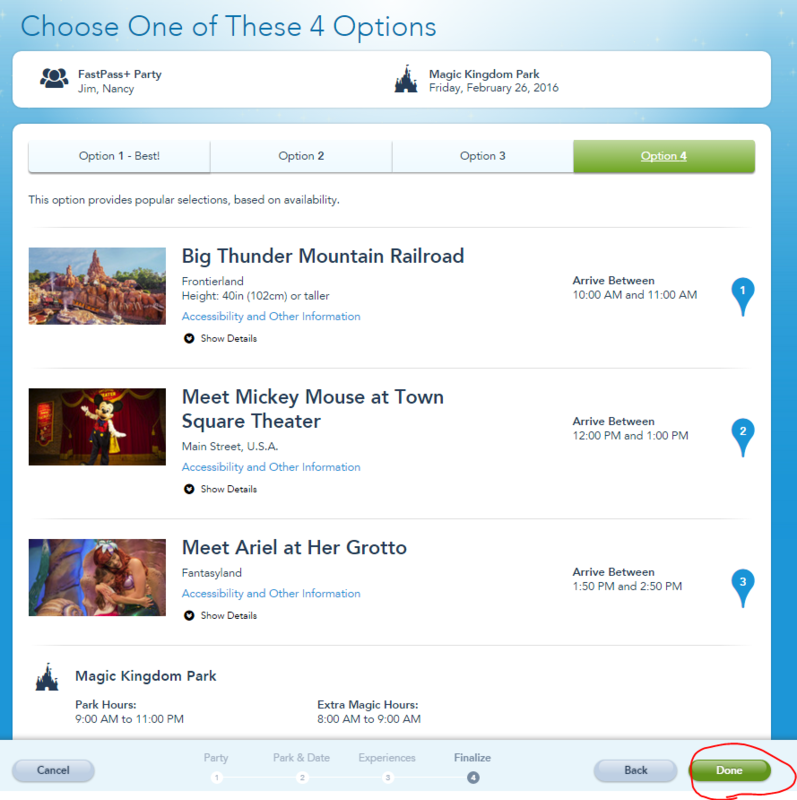 The theme parks have almost an unlimited – and as of now mostly untapped – amount of resources to pull from. Just think of the great stories you could draw from the Jungle Cruise, Haunted Mansion, Expedition Everest, or even Tower of Terror. That said, if the next book is based around Stitch’s Great Escape, I take it all back. 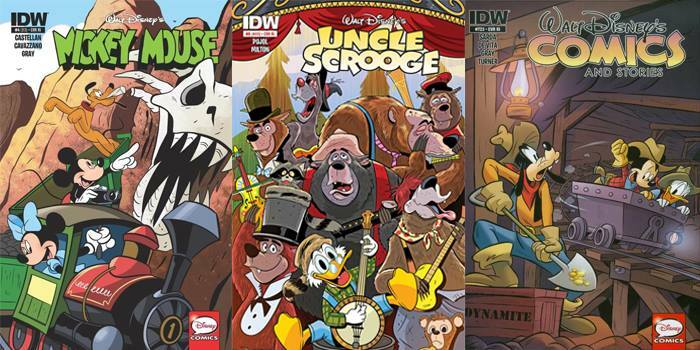 Two variant covers on Big Thunder Mountain Railroad with one on Country Bears Jamboree in the middle. For those who don’t know, a comic digest is what those Archie comics you see at the local supermarket are. Digests are much smaller than a regular comic book, but also have a lot more pages in them. This cover of Walt Disney’s Comic Digest #53 is interesting because it says Disneyland U.S.A., but also promotes a “special Magic Kingdom issue‘. 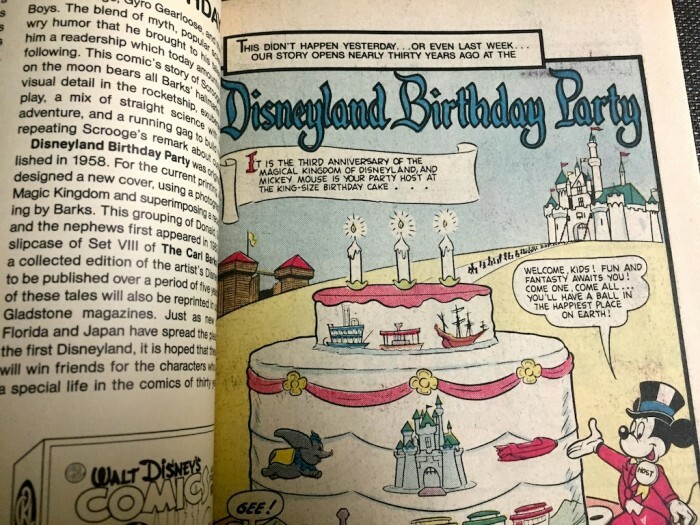 Before Walt Disney World opened in 1971 Disneyland was unofficially known as the Magic Kingdom, but this comic came out in 1975. The set-up of the book is very similar to Walt Disney’s Vacation in Disneyland above, except it is Tinker Bell giving a short introduction to each story and letting the readers know which land of the park it takes place in. 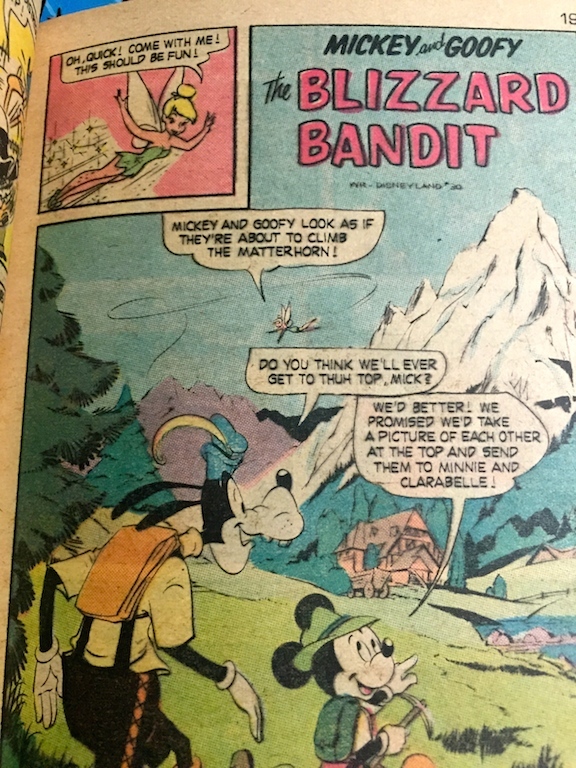 The book had me early on featuring a story of Mickey and Goofy going to the Matterhorn. and it immediately had us longing for a trip out to Disneyland. There are some other pretty interesting stories here, including a next level bananas one featuring – of all combinations – Lady & the Tramp‘s Scamp and Chip & Dale as they encounter Monstro from Pinocchio. You read that right, MONSTRO. But what makes this book stand out is a whole bunch of interesting stuff at the end. There is a one page written out story “by Minnie Mouse” on the horses of Main Street USA. Not weird enough for you? How about a four page story on the life of Young Paul Revere? There are also a bunch of one page activities including a great one featuring Morty and Ferdie riding the Skyway! But my absolutely favorite part of the book was reading a story called Moby Duck: Dry Dock Dilemma. I had absolutely no idea there was a character in the Disney Universe called Moby Duck! 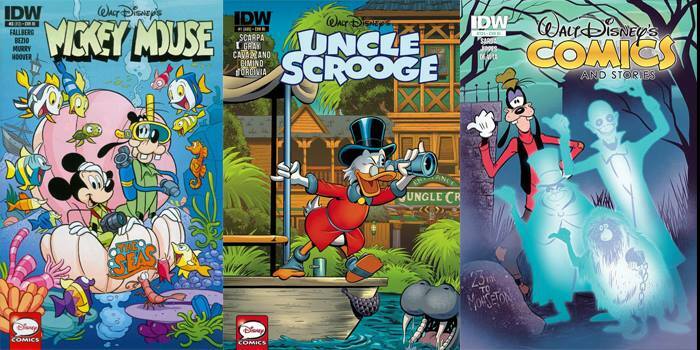 I am a gigantic fan of the Duck characters in Disney comics and consider Don Rosa’s The Life and Times of Scrooge McDuck (along with it’s companion) to be among my favorite comic stories ever, Disney or otherwise. The discovery of a Disney Duck I had never heard of blew my mind. The Living Seas, Adventureland, and the Haunted Mansion based covers. 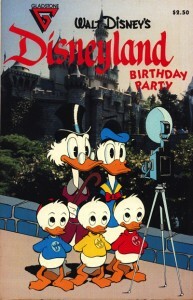 The Disneyland Birthday Party comic celebrated the 30th anniversary of the world’s first theme park in 1985. The first thing that makes this issue stand out compared to the rest is it’s cover, which places Scrooge, Donald, Huey, Dewey, and Louie in front of Disneyland’s Sleeping Beauty Castle. It certainly stands out, and animation lovers will enjoy the fact that the back cover is a full page ad for the upcoming Black Cauldron, which coincidentally had it’s 30th birthday party earlier this year. While the book is ostensibly another greatest hits package, the introductions by Mickey Mouse are much more detailed than any of the previous comics we have covered. For example, to set up the introduction of the first story of the book centered around Dumbo, Mickey takes Morty, Ferdie, Huey, Dewey, and Louie into Fantasyland where they get onto the Dumbo attraction. Later they even get into a ride vehicle for the Snow White attraction leading up to a story retelling Snow White and the Seven Dwarfs. It’s just fantastic. My favorite part of the book though was the comic adaptation of The Adventures of Mr. Toad. 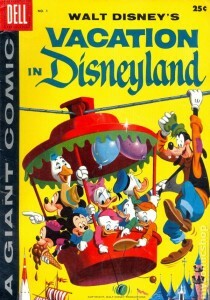 Pound for pound one of the best overall Disney comics ever made. 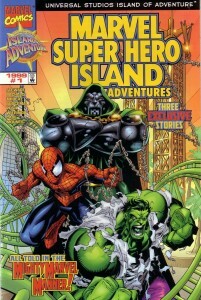 A Marvel comic based around Marvel Super Hero Island at Universal’s Islands of Adventure? Talk about perfect synergy. What makes this issue the best of any theme park comic is that the stories inside are actually backstories for the park’s attractions. And talk about top talent being put on a theme park book, Mike Wieringo was the artist for the Dr. Doom story, Sal Buscema for Hulk, and Chris Bachalo for Spider-Man. The first story in the book is actually one about the Fantastic Four thwarting a Doom plot, only to reveal at the end that Doom had taken his technology to Orlando and was going to use it on park guests. This was more satisfying story wise than the recent Fantastic Four movie. Unfortunately Mike Wieringo passed away a couple years ago, but his blog still lives on and you can see some unused art and a story on how the comic became more Doom-centric by CLICKING HERE. While the Hulk story is more of a standard HULK SMASH! villain-of-the week deal, the Spider-Man story to close out the book establishes everything to set up the Amazing Adventures of Spider-Man ride at IOA. 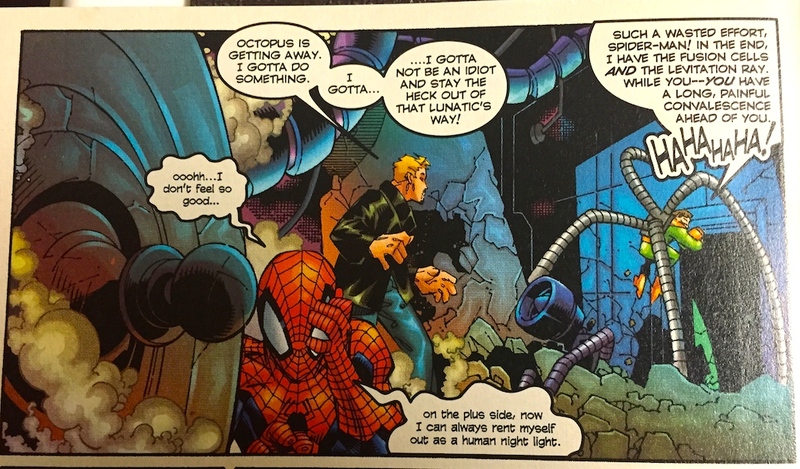 We follow the story of a reporter trying to get the scoop on a story involving Doc Ock and the Sinister Syndicate, ending with Spider-Man saving the day but Doc Ock getting the levitation ray we see used in the ride. A great little story with top-notch art. The awesome cover to this book was done by another comic book A-lister, Art Thibert along with inks by Chris Bachalo. You can see the original art to the cover by CLICKING HERE. Just stunning. Dr. Doom’s Fear Fall inside a comic! Doc Ock escaping with the levitation ray leads right into the Amazing Adventures of Spider-Man attraction. 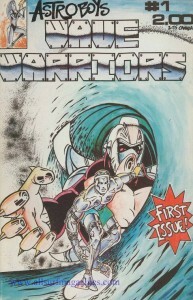 This one is less a “theme park” comic book and more of passion project for Your Humble Author, but it ties into the list because I originally got the comic at a SeaWorld gift shop back in 1987. As a child, I was completely transfixed. The book itself is sort of a mix of the movies Waterworld and Mad Max: The Road Warrior. Now this was an era before the Internet, and being a kid I was too dumb to ask my local comic store any questions, so each family trip down to Florida I would make sure we made a stop by SeaWorld to see if I could pick up issue #2. Sadly I never found a second issue, but what I found out years later was that a second issue was never made because sales of this one weren’t exactly at Batman level. 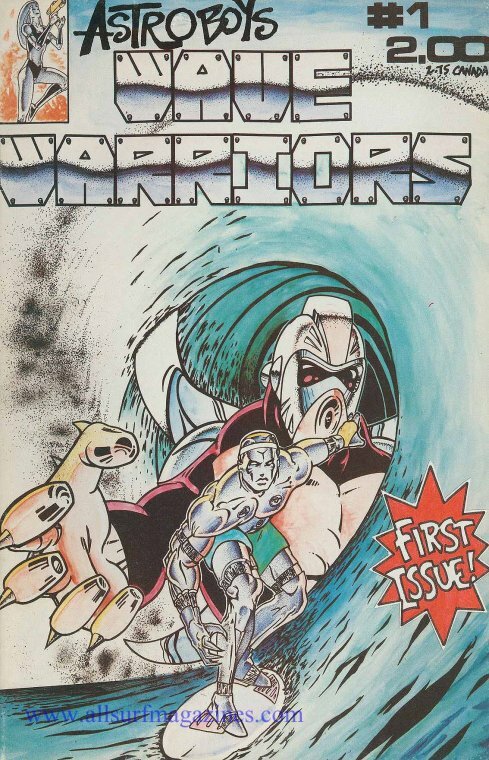 Turns out Astroboys is a surfing company and Wave Warriors was an anthology of surfing VHS tapes (“What’s a VHS tape, grandpa?”) Issue #1 was their foray into the comic market and they never went back, and looking back at the issue, it’s probably a good idea. The story and art just weren’t that great, but I did recently but a copy of #1 on eBay for $3. What can I say, the heart wants what the heart wants. I am embarrassed to say I tried over a decade to track this comic book down. Be careful what you wish for kids, be careful what you wish for…. How do YOU get your hands on comics? EASY! 1) Search on ComicLocator.com to find a comic store near you. This is the absolute best way because not only can you check out comics before you buy them, but you’ll also have access to back issues. Most comic stores also offer a subscription service where you can tell them which comics you would like every month and they will hold them for you until you can come in. 2) If you are not near a comic store you can always subscribe to books such as Uncle Scrooge or Figment through an online comic store. We’ve had great success with Atomic Empire. 3) We mentioned that the Disney parks now offer a limited amount of comics for sale, but the Universal Orlando Resort has an entire comics store at Islands of Adventure featuring solely Marvel books and another shop in Universal Studios Florida that carries a ton of DC and Image comic books such as The Walking Dead. For comic fans, here is Your Humble Author’s all time favorite graphic novels: Watchmen, Batman: Year One, Wolverine: Old Man Logan, The Walking Dead Omnibus, Maus, Daredevil: Born Again, DC Universe: The Stories of Alan Moore, Sandman: Dream Country, X-Men Days of Future Past and Kingdom Come. The SATURDAY SIX, confusing Millenials since 2013. Special Thanks to crack staff photographer Brandon Glover and blogger to the stars Megan Stump for their invaluable assistance with this article. Be sure to also check out Brandon on The Park Blogger podcast with co-hosts Aengus Mackenzie and Brian Carey. It might not have fit the criteria exactly, but I was sure you would have mentioned the 6 (or seven?) issue Haunted Mansion series. Love this post! Have you seen the Seekers of the Weird series? 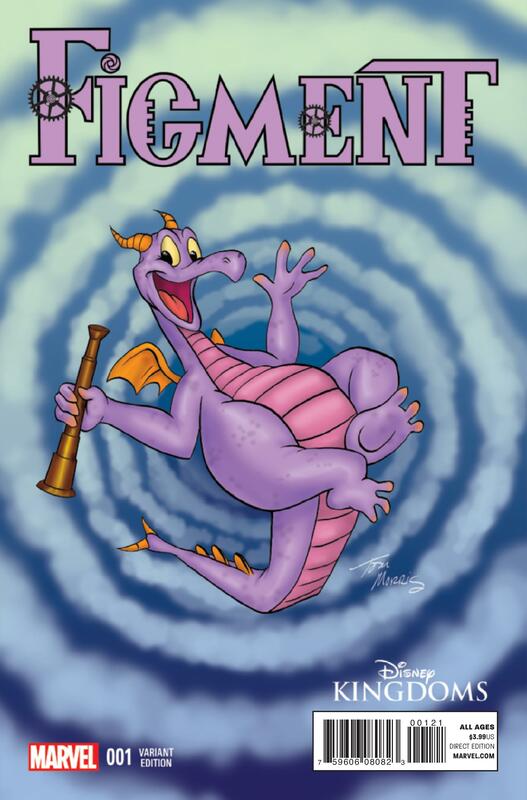 Disney put it out before Figment. Top notch story from an unused attraction plan. 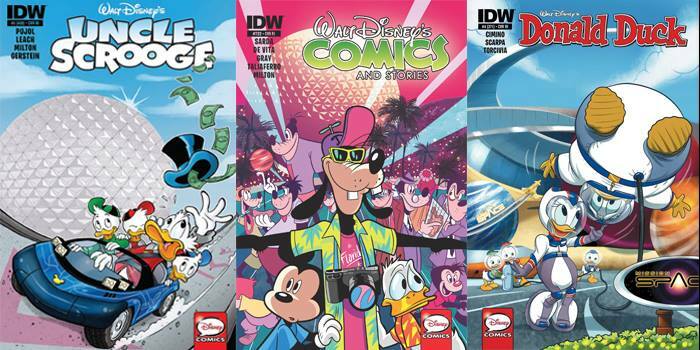 Disney not selling comics on site – I bet its because of Diamond’s monopoly on distribution. 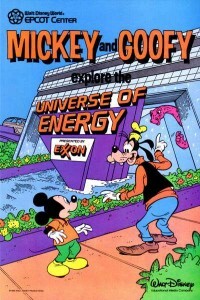 I think that Universe of Energy comic book was offered earlier than 1985. I only visited once as a kid, in 1984 (notable because of the LA Olympics) and got a copy of it. I wish that I still had that copy.